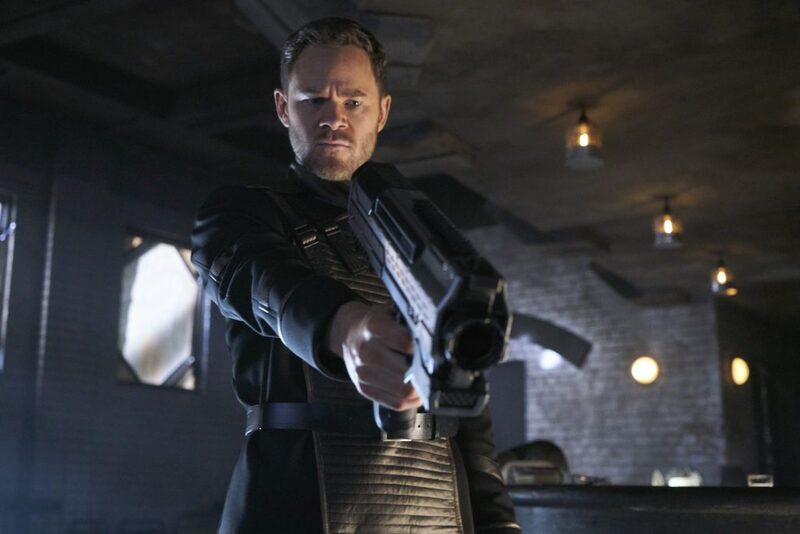 On this week’s episode of Killjoys, Delle Seyah’s delivery is not an easy one, Dutch wakes up from her coma, and Johnny is caught between his Hullen and human feelings. With Dutch knocked out still and Johnny in confinement, D’avin takes lead trying to figure out what their next course of action should be. First they have to deal with Delle Seyah’s impending birth with Zeph taking on the role of doctor and the newly deputized Pip and Pree as her assistants. The younger Jaqobis in the meantime is banging his head against the wall repeatedly because Hullen parasites are causing a massive inflammation in his brain and skull bashing seems to relieve the pressure. To make matters worse, ever since Dutch emerged from the green all the surrounding plasma seemed to have turned solid including the sample Zeph got from the Necropolis. D’avin says that they’ll just need to hope that the armada will still have some of John’s source plasma so he can be cleansed. Zeph points out that it’s five days travel to get there and they may lose Johnny before then. 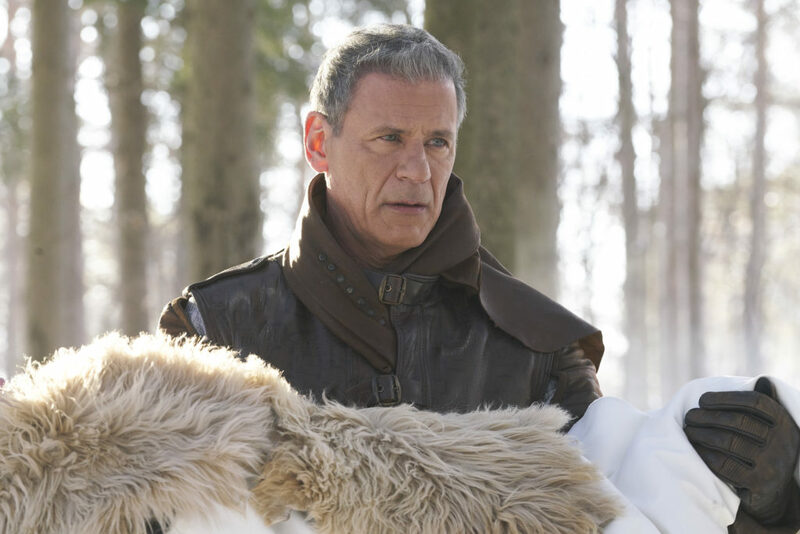 As he asks Lucy to connect him to Turin on the armada, the ship says there is no response and she can no longer locate its coordinates. Well that can’t be good. Meanwhile, unconscious Dutch is remembering her time inside the green with Khlyen telling her that this story could save not just her life but all of theirs. She suddenly wakes up when Aneela appears in her room urging her to find John Jaqobis. As she is trying to orient herself, she remembers emerging from the freezing plasma pool, shooting her best friend, and then passing out. Dutch tells Lucy to open the door but her ship refuses too, eventually saying that she’s under orders not to release her until she speaks to D’avin. So she overrides the security protocol and makes her way down where Delle Seyah is set up to give birth. Speaking of which, Zeph tells D’av that his baby is growing at an incredibly accelerated rate and that if they don’t get it out of Seyah Kendry soon she’ll have a five-year-old in her uterus. When Dutch appears though the mom to be suddenly starts to have an incredibly accelerated heart rate and as soon as she leaves Delle Seyah calms down. The Hullen mom asks if the baby is ok and Zeph says it was her who had the issue. The other woman guesses its because the Killjoy looks so much like Aneela. 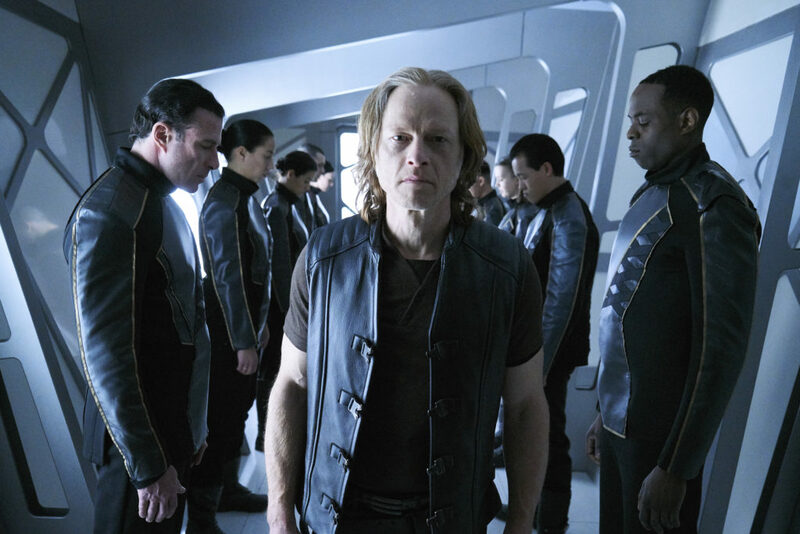 On a different part of the ship, D’av has to explain to Dutch that he was forced to improvise and turn Johnny Hullen in order to save his life from a critical injury. She gets massively pissed after seeing her best friend inside the lounge bloodied and chained up telling her to get out. Dutch slaps the other Jaqobis in anger but he tells her that she’s not the only one who loves John and she doesn’t get to judge because she wasn’t there. He asks her what happened in the green, but before she can respond he gets called back into the makeshift delivery room. We get a flashback of Dutch in the green where she’s fallen on her back and green veins appear on her skin. She’s approached by a cloaked figure and when she wakes up she is back at their hideout. Aneela is close by making tea, explaining that Khlyen is out looking for her as well. However, it’s not really Aneela as we see that her eyes go completely black when her back is to Dutch. The Killjoy puts down her tea and says that it’s not safe for them here and Khlyen’s taking too long to get back. The Lady posing as Aneela says that she needs to get out of the green with Dutch countering back that she’s open to suggestions because it’s her party trick. The other woman says that they are two of a kind and perhaps Yala can also do what she does. She then gives Dutch the cup of tea again that was still untouched. Before drinking, she remembers the story and that she was supposed to talk to Johnny once she got out. The Lady says that there might be a hidden message that tells her how to escape. Dutch then confronts her saying that she knows she’s not Aneela and asks if the other thought she was really that stupid. 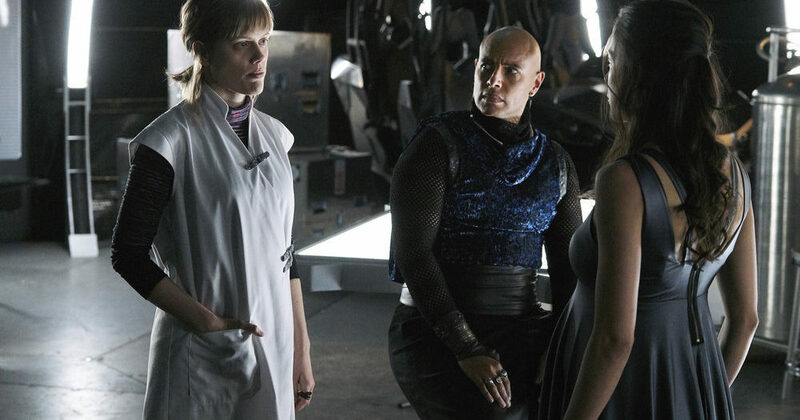 Hannah John Kamen does a fantastic job playing this villainous character as The Lady’s voice and facial gestures are totally different from Khlyen’s daughter. Dutch kicks her enemy and runs back out into the forest while being taunted that they’re going to have so much fun. Johnny is channeling his inner Jack Nicholson from The Shinning as he talks to Dutch inside the lounge. She returns bringing him some water and says that she thinks Khlyen wanted him to tell her something. He tries to trick her into letting him out of his bindings in exchange for this information, but she can tell that he’s lying. He then tries to guilt trip her by saying that if she was his real friend she would have never left and this wouldn’t have happened to him. Dutch is tearing up and admits that he isn’t wrong. She’s going to fix this somehow. Hullen John says that he can tell when she’s lying too. Dutch changes their course from the Quad to a nearby moon which is supposed to have a Hullen pool. When D’av confronts her to find out why they’ve changed destinations, she says it’s to save Johnny’s life. But uh oh it seems that all the plasma in the entire J have frozen over. The duo go to see evil John and he is pissed that he can’t be cleansed. He blames Dutch for all the pools being solid and tells her that she’s a coward if she can’t end this because he can’t live in between. He keeps losing them over and over again as his heart switches from human to Hullen repeatedly. In a sudden move Johnny comes at them with the restraint still fastened and eventually snaps his own neck. Zeph comes in and examines him, getting a sudden realization that this could actually save John. The injury is causing the Hullen parasites in his brain to die out so she sticks a knife in to prevent his healing. Dutch protests that this could kill the younger Jaqobis but gives in after D’avin says that at least could say that they tried everything. As soon as all the little green dots vanish on the screen, Zeph quickly works to heal Johnny and he thankfully wakes up seemingly his old self again asking for a mint. 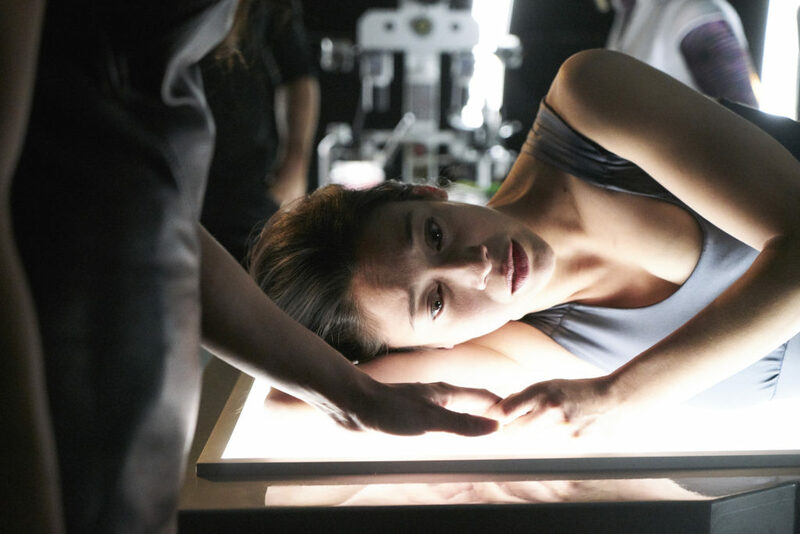 Back to Delle Seyah’s current troubles, Zeph has come up with a plan to weaken her Hullen genes enough so that they can get the baby out of her. Earlier when she tried to make an incision, Seyah Kendry’s super healing Wolverine powers acted so fast that the cut sealed up just as soon as it was made. She hooks up D’avin and the former leader of the nine to a cube for a blood transfusion but it goes horribly wrong. Delle Seyah has a really bad reaction and goes into a seizure while vomiting green plasma. Wow what is exactly in D’av’s blood?? He makes the call to stop the transfusion because it is also hurting the baby and so they are back to the drawing board. 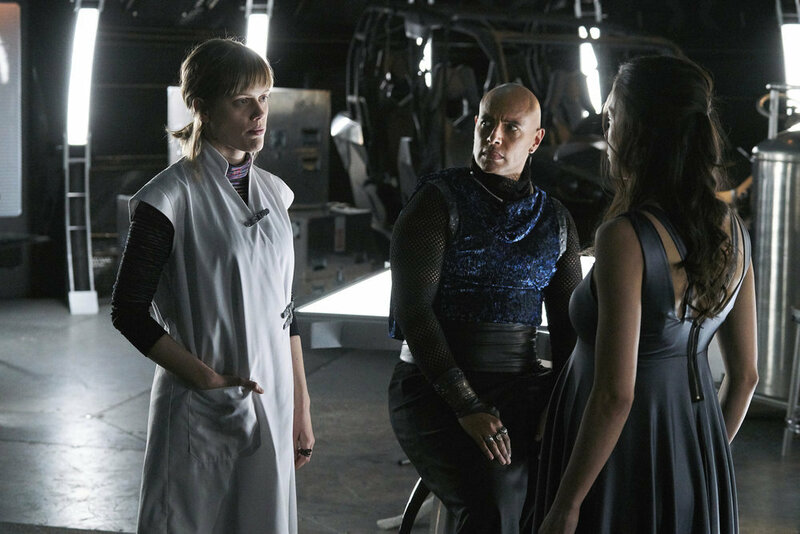 After cleansing Johnny, Zeph believes she can replicate the procedure finally deliver the baby from Delle Seyah’s belly. When she tells the pregnant Hullen and then leaves the room, the mom-to-be gets super pissed, knocks Pree out with a bowl of ice chips and goes to look for Dutch. Once she finds the Killjoy, she chokes her and demands to know where Aneela is. D’av arrives soon after though and puts a gun to Delle Seyah’s neck. She reluctantly lets go and is told that her lady love is inside the green with Dutch swearing to go back to get her because the other woman saved her. Pacing like a caged animal, Seyah Kendry explains that the Hullen leader is the only one who can protect the kid because it’s unique having come from both D’av and Aneela. Dutch then realizes that The Lady had orchestrated for this genetic baby to be created. The question is what for what purpose? A bodyguard or sorts? Delle Seyah agrees to undergo the procedure to become human again in order to give birth. Once she wakes up, her son is born, she has all these intense feelings and totally hates every second of it. Awwww! She hands D’av his kid and the baby quiets down for their first father-son moment. Meanwhile we’re still getting flashbacks on what happened to Dutch inside the green. After running away from The Lady as Aneela, she collapses and wakes up inside her harem tent with Khlyen watching her. She knows that isn’t really him and they fight! We discover an interesting detail that The Lady isn’t actually Hullen, she’s significantly older and is using them for her own nefarious purposes. Which leads me to wonder, could the Hullen and the plasma have originally a prison for extremely powerful beings? That would make sense since what The Lady really wants is to get out of the green, goodness knows how many centuries she’s been stuck inside. Somehow also Aneela’s ability to get things out of the plasma still remains a mystery to her evilness. The Lady tells Dutch that she is the missing void of memories and she needs to know why Khlyen hid her. Lady Khlyen then proceeds to beat the Killjoy into submission and even makes her relive her worst memories in order to experience maximum pain, grief, shame, and agony. Hells, that is the universe’s worst mind F. Eventually Dutch is made to drink a liquid and it seems to be the way that The Lady is able to access memories. Her ancientness then went through Khlyen’s story over and over again so that she knew everything except the reason why Dutch’s mentor told her to remember it. As Dutch tells her experience to a newly cleansed Johnny, he says that he doesn’t know why Khlyen told her their story of arriving at the Quad either. So how exactly did Dutch get out of the green? It turns out Aneela was able to send her back and she likely froze all the pools so that she could keep The Lady trapped and give her doppelganger the chance to defeat the ancient creature out in the physical world. Dutch tells the rest of the gang what happened to her and who their real enemy is. She doesn’t know how to defeat The Lady yet, but she knows how it ends and they lose. Now here comes the scary part, back in the green we see what Lady Khlyen showed Dutch a vision of D’av, Zeph, Pree, and Fancy dead inside The Royale. She’s on her knees begging Johnny who has a gun pointed at her. He then says, “Who the hells is Johnny” before pulling the trigger. She knows that The Lady will make her move now that she’s out, but Khlyen gave them the means to defeat the being, they just need to figure out what the story means. Inside the green, Aneela approaches Lady Khlyen who taunts the other woman that no one is coming to save her. The blonde looks back coldly and says that means the creature is also trapped in here with her. She then drinks the liquid without fear. It’s game on. Does the Hullen baby actually have some kind of reaction to Dutch after all because of her unique origin as coming from the plasma? Pip asking Dutch for advice on how to get passed the friend zone, poorly timed but adorable. Best line of the episode goes to Zeph, “I don’t tell you how to shoot don’t tell me how to science.” Bravo!! I suspect that the green must be some kind of prison for The Lady and the Hullen were perhaps a byproduct. 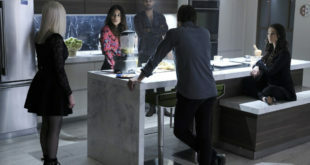 I hope we find out why Aneela and D’av can do what they can do with the plasma and what their combined genes would then impart on their son. Speaking of which does that make Dutch an aunt? It was refreshing to see this evil version of Johnny and see the acting chops of Aaron Ashmore, but I’ll happily take teddy bear John back. So now that The Lady has reactivated the Hullen, things are probably going to get real ugly on Aneela’s armada. I’m also really warming up to Aneela now. Sure she’s still not all quite there but she actually does care about Dutch.